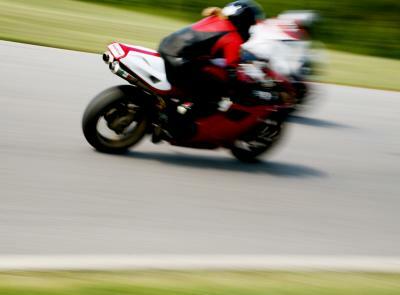 The first step in the direction of becoming a motorcycle road racer starts at a high performance track school. No matter how much riding experience you have or how fast you are on the street, piloting a motorcycle around a track is a whole new experience. Developing your riding skills on the streets is like learning how to sail the ocean solo during a hurricane. A track school, in comparison, is like a smooth-as-glass lake with an experienced sailor at the bow. A track school is the door through which you enter this world. Once you've decided which organization to race with, the only thing standing between you and going for the checkered flag is a race license. All racing organizations require that new riders have some form of schooling to prove that they have at least an elementary understanding of how to ride bar end to bar end with a pack of other motorcycles at high speed. 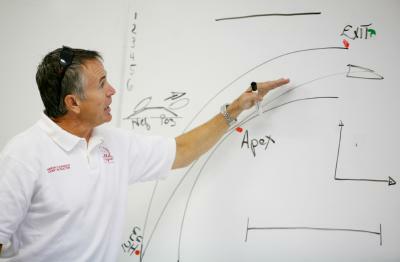 Accredited track schools vary from part-day licensing "clinics" to programs where you spend several days at the track. To make your selection, start by looking at the resume of the head instructor. See who their assistant instructors are, who sponsors them and who has endorsed or accredited them. Finally, talk to other people who have attended the school and get their opinions. Before making your final selection, be sure that the track school that you pick is certified by the organization that you plan to race with. Successfully completing most schools gives you a provisional racing license. Cornerspeed is the official track school of the Virginia International Raceway, which meshed perfectly with my plans to ride my first race at the same track. 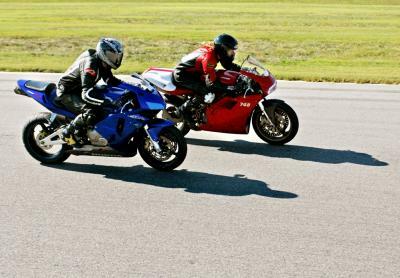 With over 10 years of instruction at VIR, it is accredited by both WERA and CCS (the organization I plan to race with). 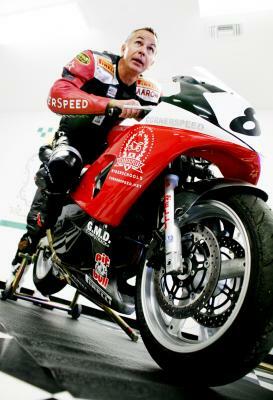 Aaron Stevenson, Cornerspeed's founder and head instructor, has held an expert racing license for over 15 years and has a WERA National Vintage Superbike Championship under his belt. His instructor roster also lists several fellow champs within its ranks. The school takes its name from the statement made in its marketing literature: "Anyone can go fast in a straight line, it's corner speed that determines who wins the race." By the time I arrive at VIR on a Monday morning, the paddock is already a bee hive of motorcycle activity. Cornerspeed schools coincide with track days and when students are in the classroom, the track is opened to licensed racers. I get unloaded, suited up and get my bike through the mandatory tech inspection just in time to make the 8 a.m. rider's meeting. Fellow students are everyone from weekend sport bike riders 30 years my senior to 13-year-old AMA Red Bull Rookies Cup rider Emerson Connor. Stevenson acknowledges that 80 percent of his students don't plan to race. They're taking a track school to improve their street riding skills. Accordingly his classes emphasize a "have fun" environment. "Be comfortable. Ride your own rhythm and your own speed," Stevenson encourages us. "Track schools are about learning, not about fast lap times." Don't let the "school" part of a track school scare you. Cornerspeed made sure the classroom portion of the day was full of information and interrupted often by track sessions. After only thirty minutes in the class we're heading out for our first track session. The mid-summer doldrums mean that Cornerspeed's usual three to one student to instructor ratio for entry level classes has been reduced to one to one. Taking a motorcycle on a race track for the first time for a person who has dreamed about it their entire life is an indescribable experience. For a person used to pushing their limits on the public roads, entering a corner without fear of gravels, spilled diesel, hidden driveways or turning mini-vans is two-wheeled paradise. By the second turn everything has become slow motion and I'm Mert Lawwill dancing with a Harley to the strains of Dominic Frontier's "The End of Love." My On Any Sunday day dream is interrupted by the frantic buzz of Connor's 125cc two-stroke machine as it blasts past me, instructor in tow. Classroom time pushes racing concepts, like body position ("hands determine everything") and looking where you're going instead of right in front of you ("whenever you look down the track, the world slows down"). Stevenson's philosophy is based on the idea that a racer is not a 'rider' but a "pilot," whose input tells their inanimate machine what to do. Questions are asked. Feedback is expected. "The only stupid question is the one that's still in your head when you're tumbling down the track," Stevenson assures us. Thrown in with the instruction on how to ride is an introduction to the practical aspect of motorcycle racing, like learning the different flags used by corner workers and what action they require from the racer. On the track, instructors take turns leading you to show you the proper lines and follow you to watch and evaluate your form. The school has placed cones on the edges of the corners to mark reference points, brake markers, turn-in points, apex and corner exits. As students gain confidence they're given an assignment for the session, from focusing on setting up a corner to navigating the track without using their brakes. My competitive nature doesn't lend itself well to a learning environment. On the street, speed is based on the willingness to take risks, while on the track, speed is based on skill. On the track, speed is based on skill. I'm trying to race when I'm supposed to be learning how to race. On my opening laps, when I should be learning the lay-out of the track, I'm right on my instructor's back tire, afraid they'll glance over their shoulder and think I can't keep up. They mistake suicidal riding for skill. As they pick up the pace I try and stay with them, quickly overtaxing my limited ability. I'm trail braking to keep from running off the track in every corner I've plowed into carrying more speed than I can manage, feeling the front start to tuck, but miraculously staying upright. At the end of one session, my tunnel vision narrowed in on the next corner, I blow the checkered flag and hold up the next group of riders. Instincts developed from years of riding over my head on the street start to hinder me. I hit my braking markers but keep my fingers covering the lever in anticipation of the car that will never pull out in front of me on the race track. Pitched over in a corner my eyes are scanning right in front of my front wheel, looking for the non-existent patch of gravel or puddle of diesel that will require a last minute escape and evade maneuver. Instead of learning each corner, I'm surviving them and as my classmates slowly start to improve and pick up the pace I'm still stuck in my frantic, on-the-edge street race. Turn five. I pick a bad line, flick over too soon, run wide and see that I'm quickly running out of pavement. At the last minute I pick the bike up, sail off the track, straight up and off the brakes as I trade asphalt for packed southern red clay. I keep the bike up and with a quick glance over the shoulder, I'm back on the track. "If you're running off the track you're riding over your head," Stevenson says. I agree. So I calm down, start to ride within my limited ability and pay attention to the instructors. A two-up ride has one form of communication. Thumbs down means, "I'm uncomfortable. Slow it down." Thumbs up means, "This is all you got?" I keep egging Harwell on by unclenching my left hand from the rail every chance I get and waving the thumbs up like I'm trying to hitch a ride on an F-22. I'm rewarded by the feeling of the big Suzuki's front wheel going airborne at the start of the front straight. It stays lofted on the maxxed-out Gixxer until we're almost at our braking marker and then its back down, barking like the landing gear on a 747 and we're back hard on the brakes. It's sad when you realize that the fastest and hardest ride that you've ever had on two wheels was when you were on the BACK SEAT. It's also sad when you think about the fact that Harwell is riding at about half of his normal pace because he's carrying you as a passenger. Is there a two-up road racing league? Stevenson describes his school as "Disneyland on steroids." The description makes sense as you stagger back to the classroom after a few laps on the back of a GSX-R. By my final sessions I've calmed down and started to follow Stevenson's instructions. The sensation of being in control makes me feel slower, though my lap times prove I'm riding faster than I have all day. Then, just as things are starting to click, the day is over. The last session of the day is the "mock" race, where students take part in a race simulation, complete with warm-up lap, gridding up and a checkered flag at the end. I start on the back row of the grid, a position I maintain throughout the three laps. The consolation prize? My last lap is my fastest of the day. Signed provisional race license in my hand, exhausted, head spinning from an information overload I struggle out of my borrowed Vansons and load the Ducati back onto the truck. It's been a long and frustrating day, as I size up the lessons learned and the opportunities squandered. Five weeks and one more track day are between me and my first race. 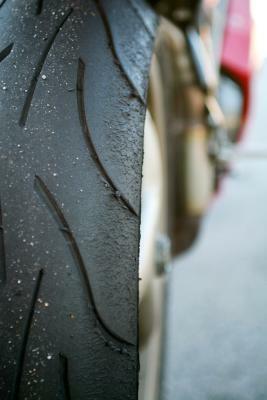 Along with a piece of paper, I leave VIR with a balled-up set of tires on my Ducati and an unbiased measurement of my riding ability. I also leave with the overwhelming desire to get back on the track racing a motorcycle as soon as possible. In the next six articles we'll walk you step-by-step through building a race bike to CCS supersport specifications.